Now that the cold weather has set in, our crucial sun time is disappearing altogether. What used to be casual afternoons lounging by the pool and soaking up rays now consists of us shivering under a pile of blankets in our beds. The biggest obstacle to overcome in the winter: avoiding the inevitable ghostly paleness. So how can we maintain our healthy bronze glows? Most people want the year-round tan but refuse to put their skin via any fake tanning, whether it be sprayed on or baked on. A quick fix for that would be any pale girl’s best friend and beauty secret: bronzer. A swipe down our T-zone, and we look like we just spent the weekend in Hawaii. It is completely harmless, but also temporary. Some of the best-reviewed bronzers are bareMinerals’ Warmth All-Over Face Color, available for $19. Readers on TotalBeauty.com reviewed this product, agreeing: “It looks natural, stays on my face all day, and doesn’t clog my pores.” For a cheaper bronzer that doesn’t slack on quality, try E.L.F’s $3 bronzer available at all major drugstores. 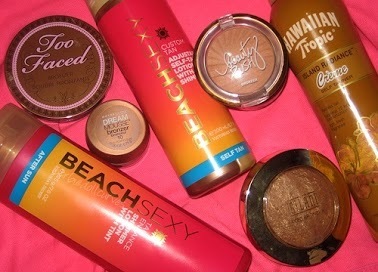 For an all-over glow, bronzing lotion may be the answer! Trusted brand L’Oreal has a great self tanning lotion for between $8-10. You just rub the tinted lotion on like any other lotion, and it creates an even, natural-looking tan. Other bronzing lotions such as St. Tropez Tanning Essentials Self Tan Bronzing Lotion (featured in Elle magazine) and Clarin’s Self-Tanning Instant Gel prove to be equally as raved about, but much pricier, around the $30 range. Much like bronzing powder, bronzing lotion is completely healthy for skin and poses no risk of wrinkles or cancer in the future, but is also pretty temporary and washes off in a shower. Consider this another effective, quick fix! Ah, the notorious spray tan. We’ve all heard the horror stories of them ending up bright orange or streaky at the most inconvenient times. Spray tans are not something to fear, just something to be cautionary of! Spray tans are harmless to our skin and complexions, so the only thing to worry about is not over-doing it. I’ve been warned that getting a technician to spray you themselves, instead of going into an automatic booth, tends to be less risky. Women’s Health Magazine has steps to achieving the perfect spray tan. 1. Test out the color on a small patch of skin before committing to it on your entire body. 2. Prep your body. Make sure to shave/wax any unwanted hair and exfoliate your skin with an oil-free body scrub. Don’t use lotion, as it can block the tan from coloring your skin. 3. Go naked! You don’t want any tan lines. Bring dark, loose-fitting clothes and flip flops to wear out of the salon. Tight clothes will make the color streak and light colors will get stained! 4. Stand still, close your eyes, hold your breath, and don’t worry! Machines and employees will leave no room for error. 5. Avoid showering until 6-8 hours later, or even until the next morning. No sweating or swimming while your tan is developing! 6. Allow your first spray tan to fade off evenly before getting another one or messing with it. The tanning bed’s potential threat of cancer and/or wrinkles in the future scares many people away, but for those it doesn’t scare off, it acts as a very quick and effective solution. The different types and strengths of tanning beds can intimidate anyone, but it is usually up to personal preference and comfort. To prevent a tanning bed burn, you want a bed with a high amount of bronzing bulbs and a low amount of reddening bulbs. Also, if you haven’t tanned on a bed before or not recently, start out slow and don’t push yourself. You have to work yourself up to a high amount of time. I personally recommend buying a week so you have time to build up the tan slowly. Tanning lotions will also be available at the salons, whether you want to buy a one-time-use packet or a bottle. They are extremely pricey in the salon; a packet can go for $5-15, and a bottle can go from $25-100. What I have found helpful is that bottles are available on Amazon.com for a fraction of the salon cost. In the past I’ve used a lotion called Primal Instinct by Australian Gold, usually about $40 in the salon, but Amazon has it available for less than $20. Also JWoww’s famous Black Bronzer Dark Tanning Lotion is available on Amazon for $14.47! In Columbia, we have a number of tanning salons that offer both spray tans and tanning beds. Pacific Beach Tan is located in downtown CoMo, offers a wide range of beds and packages and also spray tanning. They have many specials available on their website, especially for students. Another popular tanning salon near campus is Magictan Studios on Elm Street, also offering both spray tans and beds. They have three different level beds to choose from: level 1, 2 and 3. As you go up in the levels, your time in the bed gets shorter, but the power of the bed increases. The Tan Company is another great option if you want a sunless glow, sprayed on or from a bed. What a wonderful post. I have learnt so much from this blog.I like your blog.Thanks for the post.